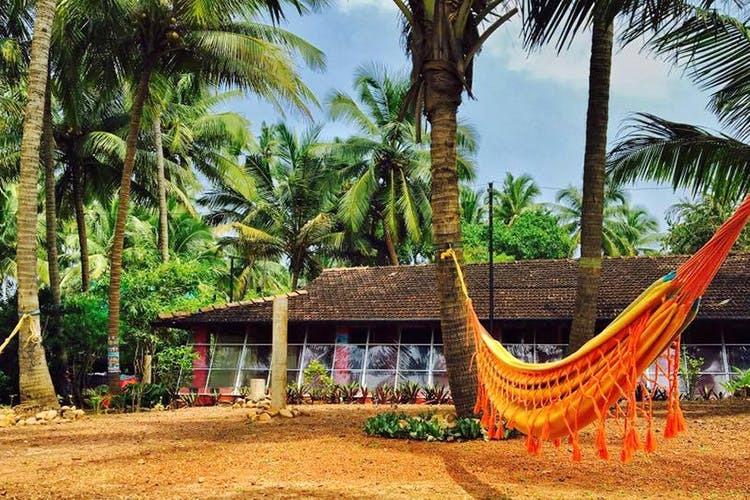 The Yuppi Hippi Hideout in Anjuna, Goa is quirky accommodation and is located close to the beach. With ample facilities, a good location and well priced rooms starting at just INR 800 a night, this is comfortable living, for you and your squad. Located just a stone’s throw from the beach and close to all the places you’d love, including the Anjuna Flea Market just 500 meters away, the Yuppi Hippi Hideout is well equipped for you to stay here without any hassles and not get bored at all. The hostel has a lot of open spaces to relax in and the underlying theme here seems to be bright, bold colours — mainly red. There is a large space outside, with some seats and cushions to sit back with a book, play a board game or enjoy a drink overlooking the waters and the sunset. The verandah is dotted with seating spaces with mats and chairs of all colours and there is a bright yellow table with some stools to have a meal at. Everything about the hostel emphasises the fact that you need to be outdoors and is all themed around the same! In fact, the only thing you would go and do inside is to go to the bathroom, or go to sleep! There is also a garden outside, for some photo sessions or relaxing evenings, sitting down with a drink for some calm. Rooms here are available by the bunk and there are also three other rooms that are named as the Music room, the Lifestyle room and the Art room. Each of the rooms have their own decor, based on their theme and so you get to experience the theme of the room you’re in. Plus, every room comes with an attached bathroom. A bunk here would cost you around INR 800 a night and the rooms are available at INR 2,000 at the lowest price, subject to change. The rooms here can be occupied by both men and women, but if a lady books a bunk, she will only be joined by other ladies. Not much is available in terms of food in the hostel except morning tea or coffee but hey, it’s Goa. There’s always a place around for you to get some food and drink. There’s also parking, adequate storage for all your luggage and you even get a hairdryer and slippers if you need em! The Anjuna Flea Market is right next door to get some cool trinkets, clothes and jewellery. Also, you could head to the Baga Night Market, 2.4 kilometres away on days that the Anjuna one is not on. For food and drinks, well, let’s just say you’re not short of options. Legendary well known places including Brittos, Titos and Curlie’s are all very close by for some yummy seafood and margaritas by the sea. For some exploring, the Chapora fort is nearby and you could always hire a bike or two and explore Goa the way it is meant to be explored.